Need a subject-matter expert or "talent" for a speaking engagement, media spot or commercial work? Subject-matter expert featured on A&E TV’s Emmy-nominated show, “Hoarders” and has appeared on numerous radio and talk-shows including The Nate Berkus Show, The Today Show, CNN’s The Joy Behar Show, Fine Living Network, and My Carolina Today. Request Geralin's Media Kit or Make an Inquiry. Geralin’s organizing advice has been featured in Huffington Post-Health, Allure Magazine, Health, WebMD, ShopSmart, BRIDES Magazine, MORE.com and many more national and local print publications. Need a spokesperson for your product or talent for your TV commercial? Geralin has worked with Office Depot, Glade, Lysol, and Harris Teeter Pharmacy to name a few. We asked Geralin to come and do a few programs for our Summer Break program at the Charlotte Mecklenburg Library. Geralin's programs were all completely full with waiting lists at the four libraries where she did programs. She is a fantastic speaker and really engages the audience throughout her program. She encourages questions, comments, and audience feedback and is very entertaining while also giving great tips and tricks for organizing. I had multiple people at each program tell me how much they enjoyed her program and thanked the library for inviting Geralin to come speak. I was also personally inspired to clean out my closet and get rid of a bunch of clothes that I had been hanging onto for almost 5 years (hoping to fit back into them)! I was very impressed with Geralin and would highly recommend her as a speaker and would love to have her come back to the library and do future programs as well. Geralin is an absolute pleasure to work with and the consummate professional. She is enthusiastic, friendly, fun, warm and engaging with everyone who approaches her. She is a draw for the consumers that we hope to bring to our home and garden shows. As a matter of fact, she is exactly what our exhibitors are looking for. Everyone participating in her seminars walks away with usable, applicable tools for life’s journey. Absolutely incredible! Geralin, we cannot thank you enough for being part of Speaking of Women’s Health. Your presentation about de-cluttering inspired and motivated our attendees beyond our wildest dreams. We would be honored to have you speak again. You are the best! Wake for Consciousness: Sacred Realms and The Conscious Healing Initiative was honored to host Geralin Thomas as she spoke about chronic disorganization and the mental health challenges related to this condition. Her insight and deep understanding of her subject, combined with her innate compassion, is empowering and inspiring. 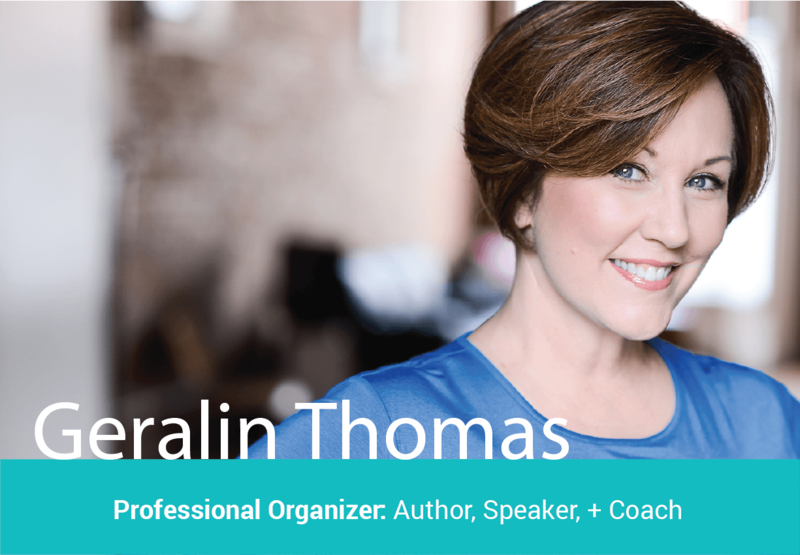 Geralin is an outstanding speaker, time management coach, and spokesperson. Geralin gave the most motivating lecture on the importance of organization in our lives. She touched on what the hidden agenda behind our clutter might be and why organization is not only important but essential in reducing the stress in our lives. I felt as if Geralin had known me my whole life. Geralin gave suggestions for overall home organization, including paperwork, kitchen pantries, as well as bedroom closets. I walked away with easy strategies to implement and I saw results immediately! The best part is that Geralin’s organizing lectures are entertaining and fun! I found Geralin’s presentation to be very enlightening! Although I consider myself to be very organized, Geralin presented many ideas and solutions that can improve my current systems, which will lead to saving time and energy down the road. Geralin is available for Home & Garden shows, conferences, seminars, or workshops on a variety of organizing topics for both small business and residential clients. Each presentation provides fundamental information, but is customized to meet the specific needs of a particular audience.